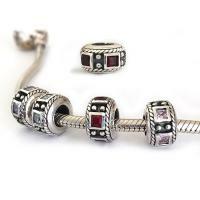 Carlo Biagi Beads in sterling silver with the added sparkle of Cz (cubic zirconia) are made in popular designs and highly sought after to personalize European charm bead bracelets. Some of these unique beads are special order so please order early to allow for extra delivery time. 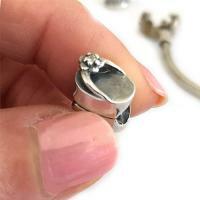 All beads have a large diameter hole and are compatible with Chamilia, Troll and other popular brands of charm bead bracelets. Sample display beads - Price Reduced! SKU B-BSC-01-02Reg. Price $38.00 $19.00 On Sale! SKU B-BSCZ-009Reg. Price $34.00 $17.00 On Sale! SKU B-BSCZ-031DReg. Price $34.00 $17.00 On Sale! SKU B-BSCZ-036Reg. Price $34.00 $17.00 On Sale! SKU B-BSCZ-040Reg. Price $34.00 $17.00 On Sale! SKU B-BSCZ-054Reg. Price $34.00 $17.00 On Sale! SKU B-BSCZ-061DReg. Price $34.00 $17.00 On Sale! SKU B-BSCZ-090Reg. Price $34.00 $17.00 On Sale! SKU B-BSCZ-091PReg. Price $34.00 $17.00 On Sale! SKU B-BSCZ-098Reg. Price $34.00 $17.00 On Sale! SKU B-BSCZ-099Reg. Price $34.00 $17.00 On Sale! SKU B-BSCZ-10Reg. Price $30.89 $21.62 On Sale! SKU B-BSCZ-108Reg. Price $34.00 $17.00 On Sale! 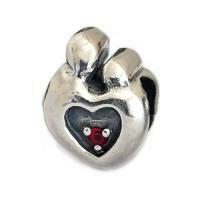 Sterling silver European charm bead for daughters! SKU B-BSCZ-110DReg. Price $34.00 $17.00 On Sale! SKU B-BSCZ-111DReg. Price $34.00 $17.00 On Sale! SKU B-BSCZ-113DReg. Price $34.00 $17.00 On Sale! SKU B-BSCZ-114DReg. Price $34.00 $17.00 On Sale! SKU B-BSCZRReg. Price $27.89 $19.52 On Sale! SKU B-BSCZS-05Reg. Price $36.00 $18.00 On Sale! SKU B-BSCZS-13Reg. Price $36.00 $18.00 On Sale!